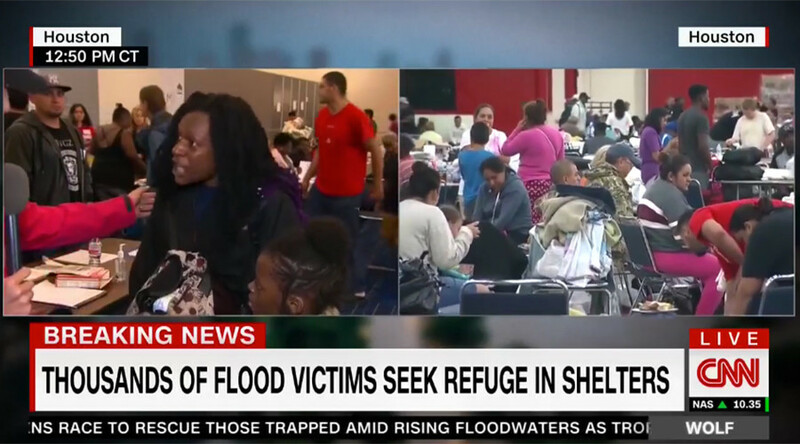 The mother, named Danielle, agreed to an interview with CNN correspondent Flores and the pair stood side-by-side at the Houston shelter. When the interview went live on-air, however, Danielle gave the correspondent a piece of her mind, in response to questioning about how she was rescued. The outburst began when Flores asked Danielle, flanked by her daughter, to talk about her experience as a mother trying to protect her kids from the storm. No kidding. If @CNN really wants to help; drop the damn mic and camera and give those people blankets and bottles of clean water. At that stage, CNN cut back to presenter Jim Acosta in the studio. God Bless that poor woman & fam glad she has the courage to speak up,she is not on display! Danielle’s comments were met with sympathy online, as many commended her for calling out the media. Many on the right jumped at the chance to attack CNN, while some journalists came to Flores’ defense. CNN reporter Rosa Flores did absolutely nothing wrong. Hurricane Harvey, now a tropical storm, has been pounding Houston since Friday. Fifteen people have died as a result of the storm and its floods.